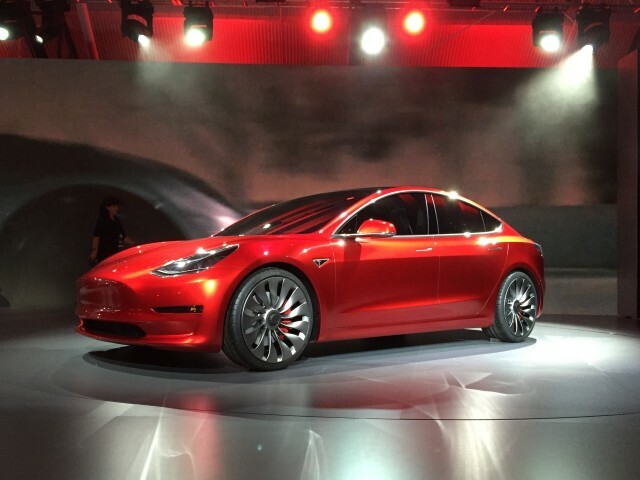 At a launch event held in Hawthorne, California, Tesla Motors CEO Elon Musk introduced the Model 3 sedan, the company's highest-volume, lowest-priced effort yet. 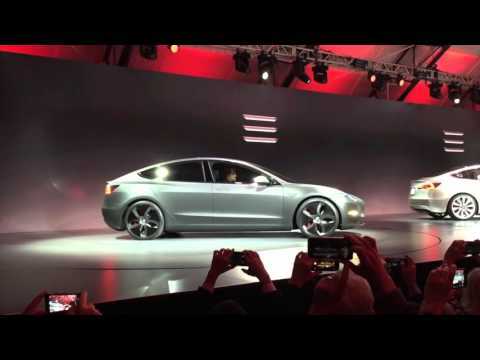 The Model 3 quite closely follows the style of the Model S sedan and Model X crossover, and it’s unmistakably a Tesla. Yet at a far more affordable $35,000 starting price, it should help break past dismissals that Tesla is a brand only for the rich. And the Model 3 is a crucial step toward the company’s goal of 500,000 annual sales. Just over the past couple of days, the company has made great strides toward seeing that goal as perhaps reasonable. In the 24 hours leading up to the beginning of the launch event, more than 115,000 people put $1,000 each down to make a reservation for the Model 3—sight unseen, and before any specifications had been detailed. Tesla wouldn’t say anything yet about the capacity of the battery packs in the Model 3, although this model is lighter than the Model S, so a smaller-capacity pack should go farther. Such a driving range would handily beat the anticipated range of the Chevrolet Bolt EV and the next-generation Nissan Leaf—both models that arguably lack the brand image and luxury cachet of Tesla. This new sedan, which will be sized quite closely to the Audi A4, BMW 3-Series, Mercedes-Benz C-Class, and others, will measure between compact and mid-size by U.S. standards. Like most of those models (and like the Model S and X), the Model 3 is rear-wheel drive, with dual-motor (all-wheel-drive) versions available. Exact dimensions haven’t been released yet—and the car that was shown was officially a design prototype—although Musk noted that the Model 3 will have space for five. As with Tesla’s other models, the Model 3 has a front “frunk” in addition a rear one—which adds up to more cargo capacity than any car of the same outside dimensions, according to Musk. Tesla moved the instrument panel forward, which allowed a more forward seating position in front, freeing up more space for the rear passengers as well. The roof is one continuous pane of glass. The Model 3 will be assembled in Fremont, California, using batteries from Tesla’s Gigafactory in Nevada; Musk noted the facility has the largest building footprint in the world. Tesla’s Autopilot suite, and gateway technologies to autonomous driving, will also be included in the Model 3. The number of Tesla locations for buying and servicing will, by that time, more than double, from 215 to 441 worldwide locations. Potential buyers must have liked what they saw, as less than two hours after the reveal, that number was already up another 20,000 or so, to around 135,000 reservations—and still climbing.